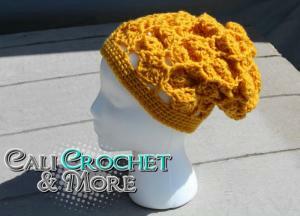 These 2 are called Wheat Fields Slouch and are from a free pattern from The Lavender Chair. 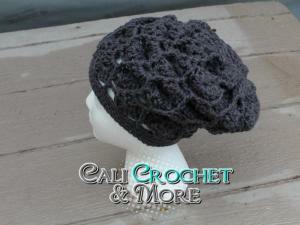 These hats only took 1/2 skein each. The pattern called for a button, but the lady who wanted them did NOT want the button on them, so I modified them so they wouldn't have the little flap. For these, she chose RHSS Charcoal and RHSS Gold. Nice hats and its great you have been able to swap for things. Very cool. What a great way to get some things by swapping. You're doing great at swapping! 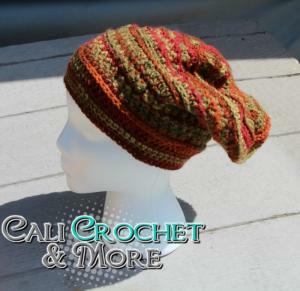 I really love all three hats, but that first one is amazing that it's one variegated skein. It worked up so perfectly that I thought it was multiple solid skeins with a variegated on some rows. Even if they don't have Autumn Sunset, I bet their other variegated would work up the same way. My thoughts exactly!! There are some of theirs that I just had to NOT buy the other day because I kept thinking they would make really nice looking hats in this pattern. Love your hats.You have done an awesome job on them.I would love to be able to barter in goods instead of money all of the time.Congrats! Wow great work. First one is especially amazing, and I have had that happen with almost running out of yarn and not having more as well. It is super stressful!!! Great hats, just in time for the colder weather!